Just consider. Every time petrol prices are raised, oil companies end up losing more money. Simply because the price differential between petrol and diesel increases further, and people gravitate towards diesel vehicles. 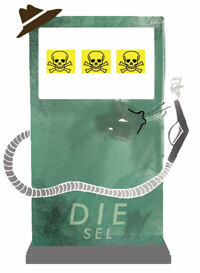 More the use of diesel, more the oil companies bleed. Worse, we all bleed because diesel vehicles add to toxic pollution in our cities, which, in turn, adds to ill health and treatment costs. Today, it makes more sense for the next car buyer to buy an expensive personal car—perhaps even a Mercedes-Benz—but run it on the subsidised diesel. Today, according to government’s own estimates, the use of diesel in personal vehicles has zoomed. Some 15 per cent of the current consumption of diesel is in passenger cars. The agricultural sector uses less—12 per cent of the country’s diesel. This busts the myth that diesel prices are kept low for reasons of public policy. In fact, keeping the price low but allowing its use in the private transport sector is clearly a deliberate policy to use the poor person’s fuel to subsidise the rich. Oil companies also say that the under-recovery in diesel is now costing them big time. It is estimated that Rs 67,500 crore is lost annually in under-recovery on account of diesel alone. This is roughly 60 per cent of the total losses of the companies. Assuming that private cars consume 15 per cent of the diesel, the direct subsidy to car owners is over Rs 10,000 crore. This is socialism Indian style: taxing the poor to pay the rich. With each increase in the price of petrol, this gap widens. Bad for oil companies; worse for the environment. The claim of car companies that the modern diesel vehicle is clean is far from true. Emission data shows current diesel cars emit seven times more particulates and three to five times more nitrogen oxides than petrol cars. There is sufficient evidence that tiny particulates—PM 2.5—emitted from a diesel vehicle are toxic and carcinogenic. This toxin is firmly associated with significant increase in cases of asthma, lung diseases, chronic bronchitis and heart ailments. Long-term exposure can cause lung cancer. The increased level of nitrogen dioxide contributes to the formation of ozone, which, in turn, damages our lungs. So be clear, diesel vehicles, however fancy and fitted, are costing us our health. Today, Europe, which promoted diesel vehicles, is paying a heavy cost. It is struggling to meet air quality standards, even though it has invested heavily in the cleanest of fuels reducing sulfur levels to near-zero and has fitted vehicles with every kind of anti-pollution gizmo like particulate traps and de-NOx catalyst. Diesel also has higher levels of black carbon, which is today understood to be a key contributor to climate change. In the US, the car mecca, where emission standards and price do not differentiate between fuels, there is no market for diesel cars. So why does Indian policy continue to provide this perverse incentive to pollute? The irony is that there is no policy that allows this use. It is a loophole. Car manufacturers struck gold when they realised that they could sell more vehicles if they could run them on cheaper and subsidised fuel. They exploit the fact that diesel price is kept lower because of its use for transportation of essential goods and for public transport—trucks use some 37 per cent of the diesel consumed and buses 12 per cent. They also know that dual pricing of fuel—different diesel prices for cars and buses or tractors—cannot be operated. They merrily exploit this helplessness. Government agencies know this. They make all the right noises about the need to fix the price distortion. The market types glibly talk about the need to deregulate diesel. They say this because they know that even though they sit in power, they cannot remove government control over the price of this fuel, which is also essential for railways, transport of public goods and agriculture. They know that the inflationary impact of raising diesel price will be high; they know it will be opposed. But they use this convenient cover to do nothing about the most glaring of distortions—the use of the subsidised fuel by the rich and for private transport. But given the rising economic cost and pollution, the option of doing nothing is not acceptable anymore. The options are either to link the price with emission standards or to ban production of personal diesel vehicles. If this is not possible, then the government should tax diesel vehicles—200 to 300 per cent of the price of the vehicle—to remove the fiscal distortion in price and policy. Our neighbour Sri Lanka has done so. In India, committee after committee has recommended that this be done. But it is not done. Clearly, the lobby for big diesel is powerful. Clearly, it sits in glitzy chambers of commerce, which can bend policy to suit purse and purpose. It’s sad and deadly. Very interesting article. Well written too. Thanks. Your article is an eye opener. While I may not be able to influence policy change I can certainly make a life style change in the effort to reduce pollution. Two of my cars, Mercedes and a Skoda, both diesel, are due for a change early next year, and I will switch to Petrol. Automobiles do make a huge collective impact on the environment and this will be my small effort. Will also mail this article to all of my friends and contact and hopefully influence them to think about a change as well. Thank you. The best method is to tax personal diesel cars heavily. Even petrol cars can be taxed more. The money can be used for strengthening our rail net work which offers the least polluting mode of surface transport. I think diesel should be priced at market rates, and, actually, it is quite easy to subsidize services meant for the poor. The State bus fleet operators and franchised private bus operators could be given a direct cash subsidy at monthly intervals, based on fleet kilometres or against evidence of diesel purchase. The railway passenger traffic should also be subsidized by giving the Railways a cash subsidy at monthly intervals on deisel train operations. All freight cargo traffic (private or railways), passenger cars and diesel gensets would need to procure diesel at retail outlets at market prices which should be at par with petrol prices. At current petrol prices, this would add about 20 per cent to the cost of truck and rail transportation costs and, since typically, freight costs account for about 10 per cent of the retail cost of products it would mean a 2 per cent increase in prices of products at the retail level on the average which is not awesome considering the current level of inflation. The rural population subsists on locally produced food and will not bear the brunt of the freight push inflation. The urban poor must be compensated by a rise in minimum wages which are extremely low anyway and need to be revised upwards sharply. There will be some cascading cost push inflation but I feel that it is a small price to pay for correcting the fuel cost imbalances and the pollution aspect to boot. Interesting observations but even in petrol consumption who subsidises the rich ,it is the two wheelers i.e. poor people who consume two third of the total petrol consumption in India. This article seems to be good and also in time. But who will take the decision? I suggest one more alternative to add to those proposed in the article. Deregulate diesel price as in case of petrol and pay subsidy to the railways and to truck buyers. The subsidy to truck buyers could be either through reduced taxes or direct cash subsidy linked to emmission devices. To make some political gain, the policy makers are shutting their eyes, which is affecting the environment very badly. The cost of this petty gains would have to borne by everyone in coming times. i fully agree that either there should be ban on private diesel vehicles or high tax as in the long run common man is going to pay for it on the cost of his health. I have been repeatedly saying that By allowing manaufacture of diesel cars the government is allowing rich people to enjoy cheaper fuel meant for public transport.Our government is controlled by bussiness people. Same is happening with CNG. CNG is clean fuel. How many people buy CNG cars or get retorofitted with CNG kit for the sake of environment? you cannot name even one. Let the government make price of diesel, petrol and CNG same you will see diesel and CNG cars vanish in a day. You are absolutely right when you say there is no difference between price of diesel and petrol in America. I always was, under the impression that diesel vehicle is environment friendly as compared to petrol vehicle. I TOTALLY AGREE WITH Miss Sunita Narain. WHERE WE ARE HEADING FOR, TO KILLING FIELDS? "This is socialism Indian style: taxing the poor to pay the rich" - True to the core. Good article but it has focused on the price control aspect but forgetting the basic problem that why an individual go for private vehicle- whether diesel or petrol driven.What is required is a strong public transport system and again a very effective promotional campaign to persuade people to use it.Nail the root cause of any problem is what is required in India. Dear Ms. Sunita I read your article with great interest. First I would like to know the references for conclusion that diesel vehicles pollute more than petrol vehicles. I was under the impression that modern diesels are in fact less polluting! You can't deny the fact that modern diesels are certainly more fuel efficient than their petrol counterparts. Instead of keeping diesel prices ridiculously low, keep them at par with petrol. A reimbursement system for public transport/ private bus operators and truckers should be put into place. They should produce their fuel receipts in order to get a refund from the government. Railways too can get the fuel directly from the fuel companies at a subsidised rate. Super taxing the diesel vehicles is not gonna happen as car companies which have invested heavily in diesel engine production lines will never allow it.. Improvement in public transport systems which are reliable, comfortable and adequate will go a long way in reducing car purchases. Your article has evoked some informed responses. The point raised is whether diesel price should go up substantially, if not more than the petrol price, keeping in view the pollution factor as well as what you have said it is reverse socialism. Minister Jairam Ramesh once had remarked that the SUVs and the MUVs are huge diesel guzzlers and hence cause much pollution. However some informed letters do not agree with the pollutant particulates as much due to modern automobile technology. However political considerations will always keep reverse socialism in motion. I end with a news item from Economic Times dated 18 Nov 2011. I quote:A top oil ministry official said it will be "suicidal" to even think of raising prices of diesel, LPG or kerosene just before Parliament is to meet or even during the one-month long session. The winter session of Parliament begins on Tuesday. These facts are unknown to the common people! This problem clubbed with the traffic/parking problem in each n every city, govt must make cars costly affair in terms of burdening it with heavy tax/duties, annual taxes,etc. Maruti 800 should cost not less than Rs.5 lakhs and so on for the other models of cars. This shall only resolve the matter permanently. As usual, this time also, you high raised a very good point. This is true that diesel cars have high polluting potential than petrol cars. The rise in sales of diesel cars is due to low running cost of the car because of subsidised fuels. Our last minister in MoEF, Jairam Ramesh, also highlighted the same issues of SUV running on diesel, but nothing concrete has been done in that field. The government cannot sell diesel vehicles at dual rate because of distribution problem, as we all understand, how the highly subsidized Kerosene is not reaching to the real beneficiaries. So cannot take risk by starting the dual pricing policies for diesel but can always take some concrete steps as: 1. The subsidy on diesel should be revoked. The farmers should be given a fixed amount of money as per their farm area and tubewell pumping. If the farmers are having an electricity based pump well, they can be debarred from the subsidy. 2. Diesel cars sells will be reduced once there will be no substantial difference between petrol price and diesel price. This will help in reducing the pollution levels in the metro cities. 3. Now a days, in Delhi, the running cost of Diesel cars and CNG cars are almost equal. This is creating a big hurdle as people are not shifting towards the clean fuel, CNG, as we always find a big ques on CNG filling stations. 4. The Eco-friendly small cars having zero emissions should be promoted in a much better way. The subsidy on electric cars can be enhanced and people using them should be presented as wise and environmental aware people. 5. There should be NO PARKING FEES for electric cars, anywhere in the city. This will promote the growth of clean cars. 6. Educational Institutional, like my college IIT, where we have almost 100% residential campuses,the resident can use more clean vehicles. No motor driven vehicle policy for IIT students is one of the wise and appreciable policy. The staff should also encourage the uses of electric vehicles. Similar policy can be applied to other institutes as well. These can be some of the suggestion to reduce the pollution levels in our Delhi. Now it is the need of the hour for the Govt to think seriously this problem, otherwise the days before CNG will come back. Thank you for your lead article on the issue of the perverse incentive to pollute and the rising economic cost of pollution. If you don’t mind I would like to clarify my position on this issue vis-a-vis the policy suggestions made in the article. I agree with the article wholeheartedly that the lobby for big diesel is powerful. But I think the time has come for us to suggest much more fundamental changes to eradicate not only pollution but one of its main causes, national and international trade. One of the fundamental errors the Indian environmental movement and, indeed, many opposition economists are making is that they are continuing to accept unquestioningly the framework of the global development paradigm that has been evolving in India over the last 60 odd years and longer. Even when remedial suggestions are made, it is in the context of these presumptions. But actually it is these starting points that are the source of the problem. From the days before Independence, the colonial power was intent on fashioning the development path of India to suit its purposes. As G Balachandran had said in an article in Frontline in 2000, "the 1920s saw the birth of many central banks under the tutelage of the Bank of England, which attempted to set itself up as a secular Vatican of monetary orthodoxy two decades before the Bretton Woods institution, the International Monetary Fund (IMF), came into existence in that role. The Bank of England intended these central banks as the first line of defence of an open international economy and the embattled financial oligarchy sponsoring it, against growing democratic and anti-colonial sentiment in their respective countries." What this means is that the normal way of living of people on this earth is a part, is organised to be violated for the purposes of international trade. And where there is international trade there has to be national trade. In a big country like India this means that an enormous amount of energy is required to keep trade going. Indeed development is premised on national and international trade. And today private consumption and private lifestyles have become interlinked to this experience of trade, so that the body and the mind are restlessly searching for new places, new experiences, new objects of desire, which can only be satisfied through movement of bodies and things. By manufacturing for trade and transporting for trade, entire regions can be destroyed. For example when they decided to make Indigo in Bihar, dense forests that contained tigers and myriad plant species were destroyed in a century or less, after having persited over millenia prior to that. The alternative to trade can be realised once we accept that the human body and mind need not be locked into the myriad of ideological and physical systems built up by invading powers and perpetuated by past and present governments in pursuit of the economic. I think it is quite interesting that Jairam Ramesh said today that his political party is neither an NGO nor a bunch of monks. By contrasting the party with these other social formations that search for the truth, he is acknowledging that the economy, to which the political party in the age of the naiton state is inextricably linked, is falling apart. James Hanson, David Wasdell and Malte Meinshausen are three of the many climate scientists who have contributed to the view of the Intergovernmental Panel on Climate Change reports over the past two decades, that anthropogenic climate change has started to happen. Despite an intergovernmental process to address the issue, it is unlikely that governments are going to come up with meaningful action through the process of holding Conferences of the Parties to United Nations Framework Convention on Climate Change. The interdependence between big business and governments is too profound. Generally we are starting to refer to this period in history as the Anthropocene, meaning that it is the era when humans are changing the geology of the earth. Climate change is one of the results of these changes, and whether you would care to analyse the combined actions of humans through the lense of Marxism or Malthusian human nature, the outcome is the likely destruction of the ability of planet earth to support the human species and most other living species due to temperature rise of up to 7 degrees Celsius over the next century or so. The scientific findings and the political implications in terms of human equality and survival are provided in short here. The reasons why the Kyoto Protocol and the UNFCCC do not adequately address the political implications of climate change are that under the UNFCCC only Annex 1 countries have to reduce emissions. This is no longer a suitable arrangement because in the 20 year since signing the UNFCCC China has emerged as the largest polluter. Historic accumulated emissions are politically irrelevant in that we have to do something about present emissions, now. Blaming the Annex 1 countries who are historically the largest polluters is not constructive. As a parallel to this problem, the Kyoto Protocol is not an adequate response because a) permits are only issued to polluters. This goes against the principle of equal sharing of the atmospheric resources. b) The caps are not tight enough, c) Emission reductions are rarely additional and d) Hydrocarbon exploration still goes on as the companies bet that the prices will never be too high - to the extent that we are nearly locked irreversibly now into 4 degrees C temperature rise partly because of encouragement to supercritical coal and to gas in India and China via CDM, and oil - via coal mine gas CERs - and others. The alternative to the UNFCCC and KP is ‘cap and share’. The good thing about cap and share is that primary producers have to buy permits to explore, exploit, and mine. The permits reduce every year, eventually forcing the hydrocarbon industry and nuclear to shut down. Secondly the permits are allocated on a population basis so those countries who are not polluting can sell their permits to those who are, thereby having leverage over the capitalist imperialists until all countries change from debt based currency to local currencies. This will happen as oil based capitalist imperalism becomes a thing of the past as permits become zero. Large countries will break up as people take control of their own land and destiny based on local biomass resources. Dear Sunita, I agree with the main policy recommendation here, namely to tax luxury diesel vehicles. However, the title as well as the opening paragraphs give a different impression, namely that diesel is the culprit--rather than the appropriation by the rich of a subsidy intended for the poor. You make this clear only in the final 3 paragraphs, although only as a concession to the harried bureacrat. A well considered article worth attention of the Union Government. The example of Sri Lanka needs to be replicated in India in order to ooset adverse balance of payments facing the oil marketing companies and deny the rich their exploitative advantages as well as safeguard our ecology to this extent. The information provided by you needs more publicity. How many know of the details you have highlighted in your editorial? Very few. Yes it is Indian brand socialism to fleece the poor to benefit the poor. My compliments for a good article. Nobody does, and more unfortunately, nobody wants to do anything. Let’s try to weigh the options that we have: Doing away with differential pricing will have its own repercussion, particularly when major chunk of diesel is also used for public/goods transport. Taxing diesel cars heavily could be a better option, but, those engaged in the business, will try to get away arguing diesel cars being less in numbers, right to do business, diesel engine technology has improved, etc., etc. One thing is for sure, we need to discourage the use of private vehicles, and this can be done by providing alternate efficient, convenient, affordable public transport. And, the idea of linking taxes with emissions should also help. I am somehow fascinated by Railways. I wonder why we can’t have more of rail than roadways. We could think of golden highway corridor but not a golden rail corridor built specially to carry goods. Many problems, but, many solutions do exist as well. What is missing is a clear vision and will. Hope, your writing does the magic. Thanks for avery informative article. I appreciate this line of thought brought forward by CSE/Sunita Narain for quite sometime. I join all who want this sense be brought into our policy and be implemented asap in India. We as people are mean and muted in our resolve so far, I am hopeful we crossed that time now. 1.Modern Diesel engines are less polluting than petrol engines of the same horsepower because the diesel engines are more efficient. However,in actual practice,the subsidized kerosene is used for adulterating diesel. On Indian roads one finds trucks and SUVs emitting gouts of thick black smoke because of adulteration and poor maintenance.One does not see this in Europe or America. 2.The prices of diesel,petrol,LPG,CNG should to totally decontrolled.The tax should be reduced. 3.The vast tracts of dry lands in India and the land being used for tobacco cultivation should be used to grow bio diesel plants like Jatropha and Pongamia. 4.Electricity is scarce in India.The farms and factories are forced to use highly polluting diesel/kerosene gensets. 5.Railways should not use electric traction.Electrification schemes should be put on hold.Electricity should be given to farms and factories. 6.THE RESULTANT SAVINGS IN DIESEL WILL BE MORE THAN SUFFICIENT FOR THE RAILWAYS TO RUN THEIR TRAINS,AND,IN FACT,RESULT IN NET SAVINGS OF DIESEL. 7.The road truck lobby is too powerful and will scuttle any moves to de regulate price of diesel. 8.Diesel driven SUVs and other personal transport should be taxed heavily -excise,sales tax and road tax. Recent Greenpeace report confirmed that Telecom operators are soon going to surpass railway as the largest consumer of diesel in India. These companies use subsidized diesel to fuel diesel generator running their mobile towers. Apart from rich private vehicles owners, Telecom operators are another big benificiary of these twisted policies. With the state of electricity supply in India, particularly in poor states like MP and UP, farmers have only diesel to depend on during critical time of sowing and subsequent irrigation needs. Being a farmer myself, I know that diesel is a vital lifeline for poor farmers till the time we provide reliable electricity or an alternative solution for irrigation. I feel cheated when Govt turns blind eye to this blatant violation of subsidy objective. The post is too long and is archaic in perception. Can people live in isolation? Without trade, if money withers away as postulated by Marx, then they will go back in time to barter. But that is also trade. Neither Marx nor Malthus referred to in the post has advocated nihilism. Even all human beings attain to spiritualism where body and mind will be completely tranquil then also animals cannot be controlled. They have to survive and destruction of forests will still continue. If there is no government because people will take control of their land then we shall go back to the jungle rule. Materialism and spiritualism are two separate domains. Destruction is as much as creation is part of the universe. Marxian dialectics or Darwin's survival of the fittest or Hindu Vedantin's understanding of the Universe all point to the destruction-creation paradigm of the Mother Earth. So let's not become hyper-sensitive about capitalism. Target is to reduce pollution. For this we should reduce number of vehicles on the road. In 80s and 90s office goers were provided with company transport and/or charted buses. With privatisation more and more HR dept of companies preferred to do away with company buses and instead provide fuel or car allowances. Increasing number of smaller vehicles (less than or equal to 10 seaters) on the road. Tourism sector in India has shifted to 10 seaters instead of luxury buses. This lead to enormous growth in private transportation. In order to reduce pollution which is our primary aim, (question for Petrol ot diesel is secondary)we should make the public transport comfortable, convenient and within reach. Review HR policy - all the offices should provide (or pool with other offices in neighbourhood) buses for transportation. Tourism industry should be forced to use luxury buses instead of people travelling in 10 seaters or personal cars . Reducing need for number of vehicles will only aid in pollution reduction ,and will also help in reducing driving stress, improved traffic movements in tourist places, lesser fuel imports etc..
Its and interesting editorial, as I perceive the Diesel vs. Petrol debate in Indian scenario is pivoted around two points : (1) pricing & subsidy, (2) pollution. I feel its imperative that the pricing differential and subsidy is a necessary need in India but, the subsidy must go to the users to whom it is targeted inclusive of public and commercial rapid mass transport of raw materials (i)road & rail and (ii) sea & air. Excellent article very factual and to the point. Why not ask Green Peace which shouts hoarse about the diesel being burnt by Airtel to power their system and has nothing to say about other ms providers, when questioned they had nothing to say;to raise the issue of taxing deisel powered personal vehicles to be taxed to the tune of the subsidised diesel that they consume. GP comes up with great ideas for protest against Govt. action but has no sugestions for alternative. How independent is independent GP? I can understand your concern, but please do see the detailed research we have done on this issue of 'clean' and more 'efficient' diesel. You will find the developments in Europe of concern as they are learning the hard facts of their dependence on diesel to cut fuel efficiency.